Site Name and Description: The District of Columbia’s homepage provides information on district resources for residents. Launched in 1999, it is the “official web portal for District government information and services.” It encompasses over 100 websites for government agencies and services. The site allegedly has won an award, but the link explaining the details of the award returns an error. Design Overview: The site has a central column of content with two sidebars, flanked by a blue background on both sides. It features the mayor’s photo prominently in the masthead and has navigation links in the top and sides. There is an auto-scrolling gallery in the center of the screen and a lower manual scroll of “DC.gov highlights,” which appears to link to various other government services. The purpose of the site as a portal is not clearly stated or conveyed through the design on the homepage. Audience: Residents of the District of Columbia and employees of various district agencies. 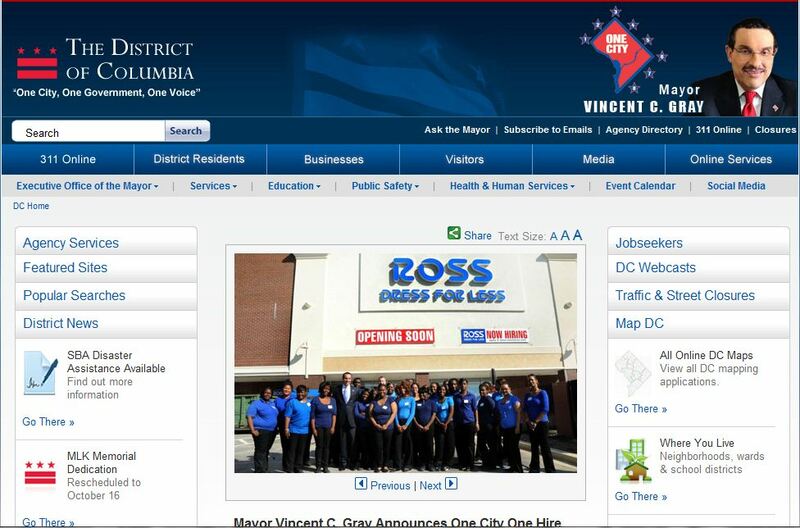 Business/Site Goals: To provide district information and reduce in-person office visits for city services. Social Media Integration: There is a “Social Networks” page with links to Facebook, Twitter, YouTube and Flickr, with a feed of the Mayor’s Twitter account.